Pharaonic Egypt is arguably the most famous ancient civilization on the African continent. This does not mean, however, that it was the only ancient civilization that sprang from African soil. Egypt’s southern neighbors, the Nubians (Egyptian for ‘gold’, due to the abundance of this precious metal in their lands), have had an uneasy relationship with the Egyptians over the millennia. At times, they were seen as allies of the Egyptians, while at other times they were seen as the wretched enemies. 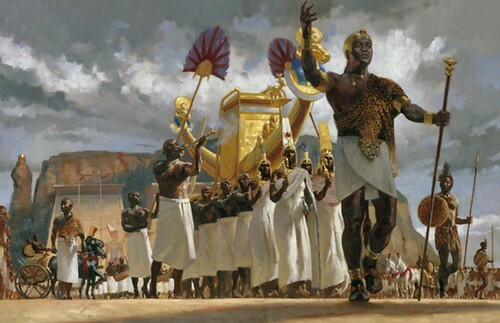 Under the Kingdom of Kush, however, the Nubians would conquer Egypt and establish a dynasty of their own. 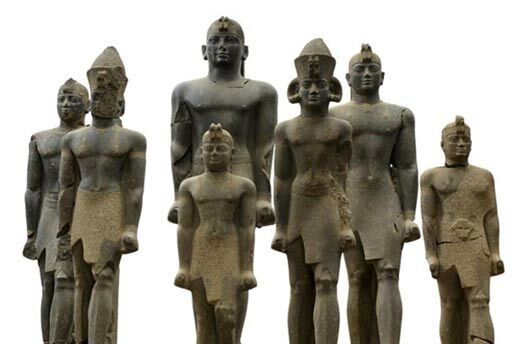 Nubian Pharaohs . Photo source: Wikimedia. The Kingdom of Kush was already in existence during the time of Egypt’s Old and Middle Kingdoms (ca. 2686 B.C. – 1650 BC). During this period, it was based around the settlement of Kerma, just above the Third Cataract of the Nile, in Upper Nubia. It was, however, only during the Second Intermediate Period that the Kingdom of Kush rose to power. As Lower Egypt fell to the Hyksos at the end of the Middle Kingdom, the Kingdom of Kush came to be the dominant power in Upper Egypt. The success of Kush as a regional power, however, is a puzzle that continues to baffle archaeologists. Without the conventional features of complex societies – a writing system, an extensive bureaucracy and major urban centers, the Kingdom of Kush’s success in controlling Upper Egypt seems to be an anomaly. The control of Upper Egypt by the Kingdom of Kush, however, would not last for long. With the emergence of the 18 th Dynasty in the mid-16 th century BC, Egypt was able to present a united front against its Hyksos overlords. Having expelled the Hyksos, the rulers of the 18 th Dynasty set their sights on its Southern neighbors. This resulted in the ending of the Kingdom of Kush, as Nubia became an Egyptian colony under the rule of a Viceroy of Kush. With the collapse of the New Kingdom (ca. 1070 BC), however, Egypt’s control over its southern neighbor was once again weakened, and the local elites were able to regain control over Kush. During its early days, the Kingdom of Kush was centered at Napata, in modern central Sudan. The fragmentation of Egypt’s kingship in the 8 th century BC was an opportunity seized by the Kingdom of Kush. 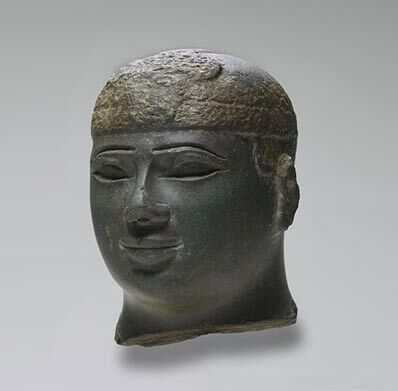 Division and internal political instability in Lower Egypt allowed the Kushite king, Piye, to launch a successful campaign in about 727 BC, thus establishing the 25 th Dynasty. In spite of this initial victory, Kushite rule in Egypt would last for less than a century. This was due to the expansion of the Neo-Assyrian Empire in the Near East. Although the Kushites were initially on peaceful terms with Assyria, Egyptian support for an anti-Assyrian coalition in the Southern Levant at the end of the 8 th century BC sparked hostilities. In 671 BC, Egypt was invaded by the Assyrians, and the Kushite Dynasty of Egypt came to an end in 654 BC. This was not the end of the Kingdom of Kush, however, as they continued to survive in Nubia. The survival of the Kushites can be found in the records of writers from the Roman period. Strabo, for instance, describes a war between the Kushites and the Romans during the 1 st century BC. Although the Kushites were never absorbed into the Roman Empire, its power was in steady decline. By the 4 th century AD, raids by nomads from the south and the east would severely sap the power of the Kushites. Eventually, the emerging Kingdom of Axum in Ethiopia would capture and burn the Kushite capital of Meroe to the ground, thus marking the end of the Kingdom of Kush. So the Egyptians has a very complex writing system and life in general, and the people of the Kingdom of Kush didn't have any of those things but they were still able to take over? Seems like more than an anomaly. I am Nubian, and I find the name "Kush" weired and derogative. In modern Nubian language "Kush" is from Kushad which means "bad". I guess that this insulting name "Kush" was given the the great old Nubian state, land, people and empire by unfriendly foreign nation! 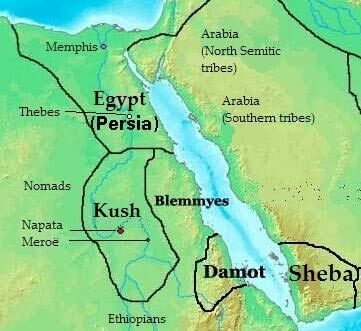 My question here, is there any Nubian archeological eveidence to prove that the Nubian made and used the term "Kush" to describe themselves? I am a Sudanese Nubian as well, there is no evidence that in any of the Kingdoms of Ta-Seti (land of the Bow because of our skilled archers and army) known as Nubia ever named themselves Kushites. There was one Kingdom called Ksh, and also a bowl described in this in Nubia...just like Nubia had other kingdoms and regions such as Meroe, Napata, Napta Playa, Kerma, Alodia (Alwa) and Nobadia. Now Nubians or Nobas recieved their name from the Nubian King Selko, and united the Black and Red Nuba's or Nobadian's...also in Kemet (Ancient Egypt) they referred to a our region of Ta-Seti as Nbt (Nubt) land of gold, which was described as a city or land of Gold. However, Ethnically we were never called Kushites.